Did you know that 92% of all customer interactions happen over the phone? Thats a lot of phone time. With so much time allocated to phone calls, you want to analyze your process to make sure you’re maximizing efficiency. Each rep in your sales team needs to train and improve their phone technique. You can shave hours off of your month by automating processes and developing the most efficient routine possible. This time can be used to focus on nurturing qualified prospects and closing deals. Sales training pro Mark Hunter - known as The Sales Hunter, says you must always be prepared for your calls in order to be effective and efficient. There are a number of ways to reduce time wasted during and around calling time. I don’t want to give you “productivity hacks” here. Shortcuts are just that - short term. There are no shortcuts when you are looking to make lasting improvements to a sustainable sales process. If you want to scale growth you need to think beyond shortcuts, so each of these tactics will help you improve your sales calling game and offer significant impact over time. 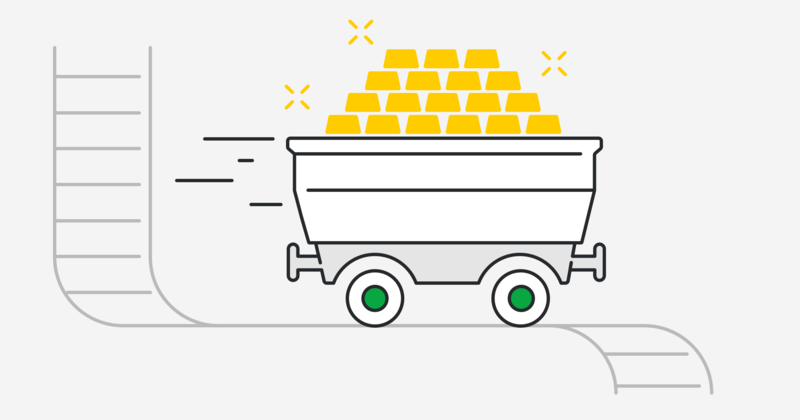 We’ve compiled a list of 3 ways you can generate sustainable results by leveraging automation that will obliterate sales calling time waste (and stick around for a bundle of cold calling resources to help you make some serious strategic improvements). Datanyze’s free Chrome Extension instantly reveals valuable, high-level information about the company of the website you’re browsing. Its an efficient way to research accounts, build targeted prospecting lists and export lists where they need to go in faster time. Do you want to know what tools your prospects use or see their company revenue at a glance? Datanyze Insider helps you see things like revenue, employees and the current technology providers they use to quickly access more of the right info, helping you better understand the context of your lead’s situation. This time-saving knowledge will translate to more targeted conversations with your prospects which means more opportunities. With sales reps spending up to 40% of their time looking for someone to call being able to build targeted lists will result in more efficient cold calling - in fact, that info will help warm up the call a bit because of the competitive intelligence it provides. That intelligence translates into more personalized calls which improve chances of conversion to a demo or meeting. Are you selling something new to an existing customer but you have no idea about their latest interactions with you or your team? Still wasting time searching for details? No nonsense call center apps like Nectar Desk and Toky integrate with CRM’s like Pipedrive to make your helpdesk conversations part of your contextual info on a contact. You need to know what has been happening with an existing customer before your next conversation. Leveraging this pre-call knowledge can be the difference between closing a deal, nailing an upsell or losing a red-hot lead altogether. Nectar Desk allows you to pick up where you last left off with a client which will not only help save time but save you the embarrassment of forgetting important information from previous conversations. Nectar Desk can be set up to integrate with your CRM in minutes. Then you can make calls and send sms texts without leaving your CRM interface. Calls are logged automatically to save salespeople time. 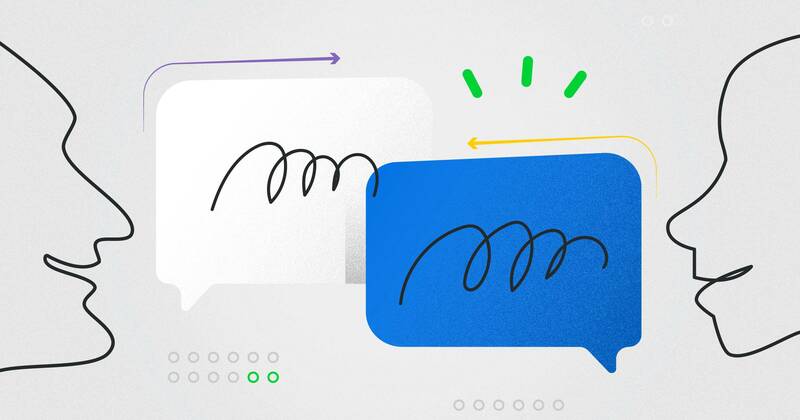 You can see the latest conversations that have been had with your customers company-wide, and you need never disturb all your colleagues (and taking away from their sales activities) with a million questions about last interactions again. 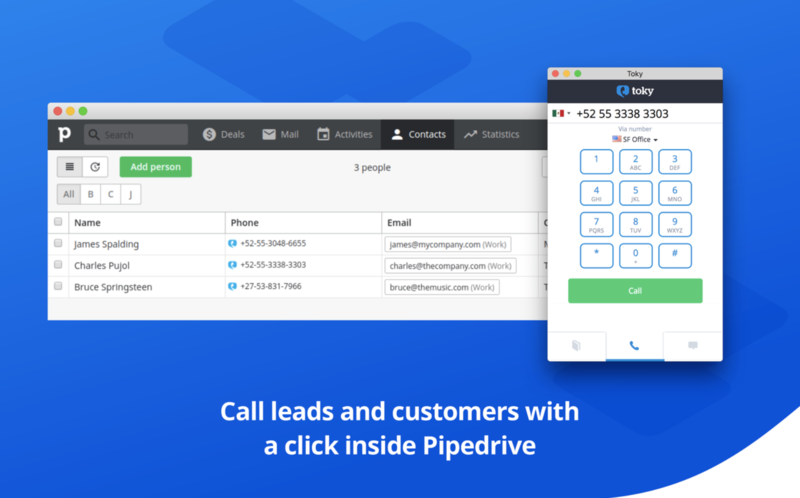 Pipedrive’s Toky integration allows you to automatically log inbound and outbound calls, record them and click to call inside your CRM. 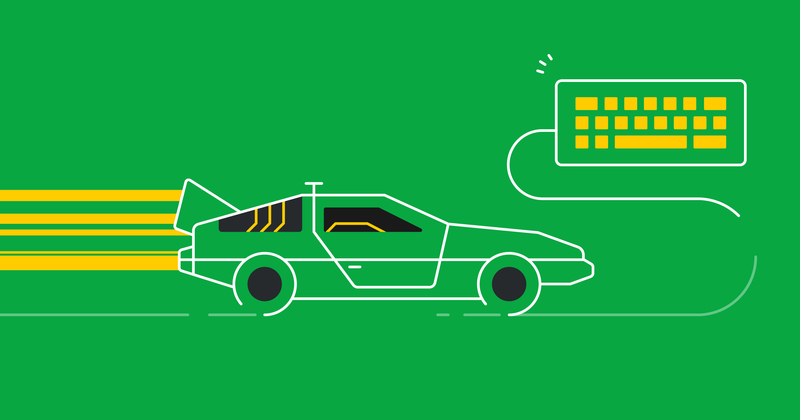 You can call leads and contacts with a single click without leaving Pipedrive. Automatically log inbound and outbound calls, text messages, voicemails and missed calls for all contacts with all the details you need for reporting on those activities. Integrating your CRM with automation technology can make phone calls so much easier to track and manage for your sales team. You can integrate Aircall with Pipedrive to call your prospects and synchronize your caller history automatically, improving workflows. Simply utilize the 1-click integration and you are ready to add your team to the system. 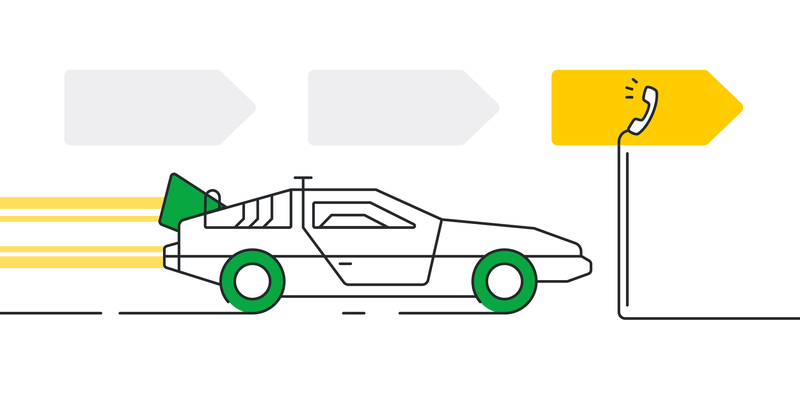 You can set up Pipedrive’s Aircall integration to enable your reps to automatically retrieve client history, significantly increasing your call efficiency. With click-to-dial, your reps will no longer spend 15 workdays a year just entering phone numbers. Click-to-dial and screen pop capabilities integrate directly into your CRM or Helpdesk so our team has the information they need at all times. Screen-pop capabilities mean you won’t have to scramble to find info on the client or prospect who’s calling or you can simply click-to-dial to call a prospect directly from Pipedrive. This allows your sales team to log all your calls, take notes and access everything directly from Pipedrive. No longer will you have to keep a client or prospect on hold (which increases the probability of lost deals) while you try to figure out who they are or what stage of the sales funnel they are in. I don’t just want to lead you with a list of tactics, so I’ve pulled together a collection of strategic advice to help you and your sales team strengthen your sales calling game. Here’s five detailed educational resources you can work through to make some serious sustainable improvements. 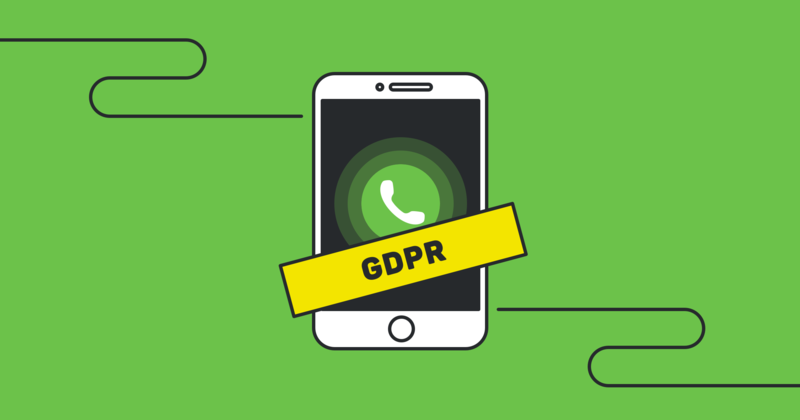 Make Sure Your Sales Calling is GDPR Compliant! You need to understand your GDPR cold calling responsibilities if there is any possibility at all that you may be contacting a EU resident. The price of non-compliance is steep. Companies caught violating GDPR can be fined €20 million Euros or 4 percent of global turnover, whichever is higher. The GDPR doesn’t mean cold calling is dead, but you do need to gain permission from your prospect before you make your call. Sales can work directly with marketing to qualify leads before the sales team makes contact. The marketing team can use lead generation programs to warm up prospects and gather the required permissions through web forms so that a salesperson can reach out on a call. Offering value in the form of a demo or an expert consultation makes permission for a call easier to generate. The upside - pre-qualifying the leads you call could save you so much time in the long run. You’ll be focusing more of your call time on the prospects who are more likely to close, eradicating any time you spend on cold leads who aren’t ready for a sales conversation. The GDPR might be the perfect prompt to improve the lead qualification aspects of your sales process and slash a whole bunch of unnecessary time out of your sales process. Want 25 more pages of expert sales advice to help you improve your sales calling? This Sales Communication Handbook will explain how you can take advantage of cognitive biases to get inside the mind of your prospects and control your sales conversations.